Intrepid readers may recall that Spectacle: Elvis Costello with… has been renewed for another season, and it just so happens that the Season 2 tapings start next week at the historic Apollo Theatre in Harlem, NY. Check out the information below for the first list of announced guests and details on how to get tickets. As I also mentioned back in April, a DVD release of Spectacle was being planned and the release date for Season 1 is now set for November 3 (it will also be available on Blu-Ray disc). Each episode has been extended for the DVD release and the 4 disc box set (or is it 5 disc?) contains over 90 minutes of special features. 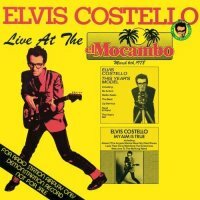 Last but certainly not least, Elvis’ iconic 1978 performance at the El Mocambo in Toronto, Ontario kicks off a new series of live albums from Elvis Costello. The El Mocambo record was originally only available as a vinyl radio promo and was (and still is) extremely valuable as a collector’s item. Though bootlegs have circulated for many years, the Live at The El Mocambo performance was officially released on CD as part of the 2 1/2 Years Box Set in 1993. This disc marks the first in a series of “Costello Show” live recordings which will be comprised of “classic Costello concerts including a performance at Hollywood High in California and other shows to be announced”. It’s interesting to note that Costello has never released “a proper live album” unless you count the aforementioned El Mocambo promo record, the limited edition Costello & Nieve EP box set, the jazz inspired My Flame Burns Blue, the Deep Dead Blue EP (w/ Bill Frisell) or the various live bonus tracks that have shown up on the re-releases over the years. Live at the El Mocambo comes out on September 29 and it’s a must record to own if you don’t have it already, but as an old school fan, I’m much more interested in those “classic Costello concerts” that haven’t otherwise seen the light of day. 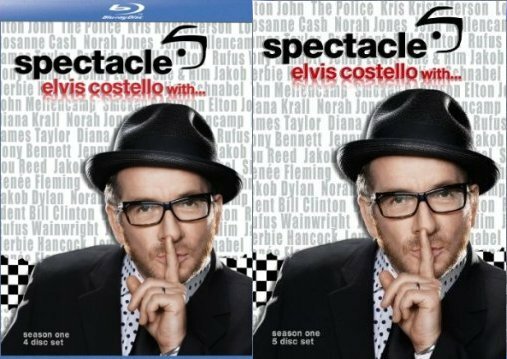 Check out the full press releases for the Season 1 box set of Spectacle: Elvis Costello with… and The Costello Show concert series after the jump. Elvis Costello’s aim has never been truer in thirteen up close and personal episodes of chords and conversation with superstar singers and songwriters including Elton John, The Police, James Taylor and John Mellencamp. Shot last year at storied New York venues, Harlem’s Apollo Theatre and NBC’s 30 Rockefeller Plaza studios, Costello with his band The Imposters split each hour between colorful creative discussion and putting a new spin on classics like Purple Haze and Ballad of a Well Known Gun. • Four disc set with over 90 minutes of Special Features including Behind-The-Scenes interviews with Elvis Costello and other performers, Bonus Songs, and more. This is a historic TV series that is a must for all audiophiles. The DVD and Blu-ray sets are also available for pre-ordering on amazon.com with a release date of November 3. SANTA MONICA, Calif., Aug. 18 /PRNewswire/ — The first edition in The Costello Show live performance series of complete concerts featuring Elvis Costello finds one of the most eclectic and acclaimed artists at the fiery start of his career. Live At The El Mocambo (Hip-O/UMe), to be released September 29, 2009, marks Volume 1 of his Elvis Costello -The Costello Show series of albums. During the next year or so, The Costello Show series will continue with the album releases of significant classic Costello concerts including a performance at Hollywood High in California and other shows to be announced. Recorded March 6, 1978, at the sold-out El Mocambo in Toronto, Canada, and broadcast live by CHUM-FM, this Elvis Costello and The Attractions concert was released the same year on about 300-500 pressings of a Canadian promotional album that became highly collectible–and heavily bootlegged. In fact, it may have been the most bootlegged of all Costello albums. The album was officially released in 1993 as a bonus disc in the four-CD box set 2 1/2 Years, and was also made available to those who bought the other three CDs separately. In 2003, Costello was inducted into the Rock and Roll Hall of Fame and the following year was ranked by Rolling Stone among its 100 Greatest Artists of All Time. Live At The El Mocambo flashes back to a performance when Elvis Costello was just beginning.